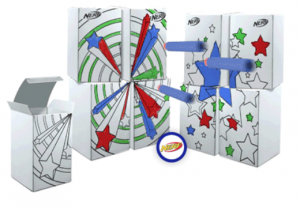 On Saturday, December 8th from 11:00 a.m. to 12:00 p.m. local JCPenney stores are hosting a create you own Nerf Target for free in their Kids Zones. Each store will have all of the materials necessary and kids will also receive a collectible pin when they complete the craft project. Parents will get a 10% off purchase coupon for in store use only on the day of the event. The coupon can be combined with other coupons but cannot be used on toys.